The idea this weekend was a joint trip with the Angeles Chapter Ski Mountaineers. We left town Friday night, and met the group in Mammoth Lakes, CA. We no doubt had a nice breakfast in a highly civilized style. Ski mountaineering burns a lot of calories, so this was no time for a diet! A good-sized group of us headed off near the ORV area up a dirt road, then carried our skis on our packs cross-country up to what is known locally as Sherwin Bowl. I was carrying my regular 35mm camera equipment plus an old Bolex Rex 16mm movie camera. I was determined to film some great skiing! We had with us a Bishop local who was renowned for his 1950's ski descents on big Alaskan peaks, and was he a great skier! We had a lunch and rest at a sort of base camp on a dry scree slope. We were all free to ski as we pleased. Some went to the top of the ridge, where it was steeper, and made a lot of turns. I was fortunate to obtain spectacular footage of two runs by our great skiing champion, which I hope someday to transfer onto a web site Quick Time video. The wind was strong, but we stayed at it all afternoon. Finally, it was time to ski back down, and then hike to the primitive parking. Probably going somewhere in town for dinner, we enjoyed a good night's sleep and stay at a condo. The next morning, the weather dawned perfectly. The sun was out, and the air was still. Our northern contingent broke off from the SMS group, and I led us to ski the north slopes of San Joaquin Mountain via the Fern Creek Trail. This is a 4,000 feet gain climb, over some four or five miles one way direct. Motoring around to the June Lake Loop, we found the crude trailhead parking, and took the signed, clear trail up to the snowline. The four of us were energized, and soon reached still frozen Fern Lake. The view of the north slope was inviting, but intimidating. We promptly started up to climb this steep gully. At its top, the terrain lessened in its grade considerably. 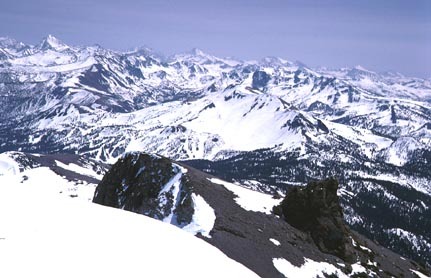 The main summit ridge of San Joaquin Mountain is gentle skiing terrain, and the weather was excellent. We were climbing in T-shirts, and the sun was doing its superb work in warming up the snow. I tried a few turns on the way up. My teles were as smooth as butter. We gained the summit, and everyone was in a great mood. I recorded the views, both here in the two photos. 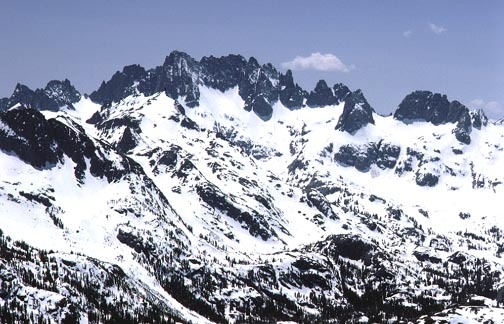 The Minarets are seen above. The lower photo is to the south. Then came time to ski down the mountain. We knew it was the best corn snow that could ever happen. We were all good skiers, making hundreds of telemark turns. Coming to the steep part, I slid about forty feet as I lost a telemark on a 40 degree slope. I easily stopped myself, as the snow was mush underneath. The challenge was met well by the group, and we gathered at the base of the bowl. Running out of snow at about Fern Lake, I took off my Epoke 900 skis, which I had used to test the spring touring ability of this discounted, clearance purchase. I always say that it's not the ski, it's more the skier. Or, the snow in this case. We hiked back down the trail, and arrived at the car in good order. Some of the others hadn't had enough! We said our farewells, and were off for home by 5 p.m. It is incredible how fate works such a hand. In the outings schedule, this is deemed a tour for highly advanced skiers. We were to return next year, and came up with stormy conditions, and icy snow. But we'll all remember this great ski day we had on San Joaquin Mountain!